We have e-commerce businesses for books, flowers, electronics goods and so on. What next? Handicrafts. India is the land of handicrafts ranging from brassware to wooden crafts to paintings to zaris to traditional pottery to crockery. 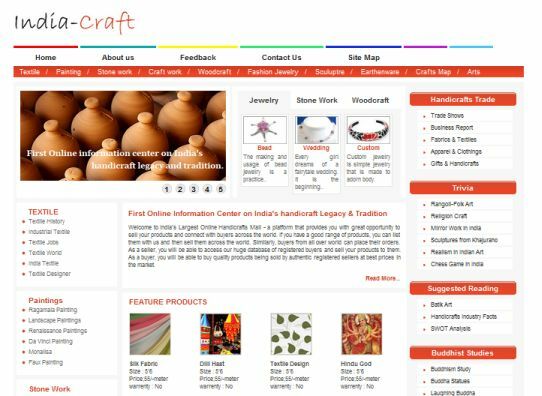 New Delhi-based Nethaat Softsol Pvt Ltd has launched Nethaat.com, an e-commerce website focused on handicrafts, to take advantage of the demand for handicrafts in India and overseas. Launched in January, Nethaat sells a range of products from hand made earrings priced at Rs 50 to marble replicas of Taj Mahal, posters, tabletops and at the higher end, paintings worth Rs 60,000. Nethaat hopes to do in India what Etsy, a similar business in the US, has done in that market. The New York based handicrafts e-tailer has grown from $180 million in sales in 2009 to $314 million in 2010. It's another matter that the US e-commerce market is well developed compared to what India is currently. 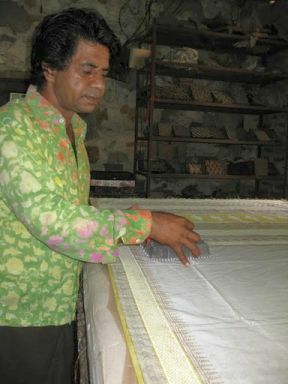 The founder of the Nethaat, Rakesh Sonava, has a deep interest in Indian handicrafts and art. A supply chain professional who has been employed at retail chains in Canada such as Walmart, Loblaws, Sobeys, Metro and Giant Tiger, Sonava is an alumnus of Schulich School of Business, York University, Toronto. His forefathers were hand print artisans and from here stems his interest in setting up an online presence for artists of India. Sonava is not afraid to admit that he was inspired by Etsy, the original marketplace for handmade items. "We know. Etsy.com has been a huge success and we want to mirror that in India," he says. Nethaat.com bears a strikingly similar design to Etsy.com, which was set up in 2005 by painter, carpenter, and photographer Rob Kalin along with Chris Maguire and Haim Schoppik. 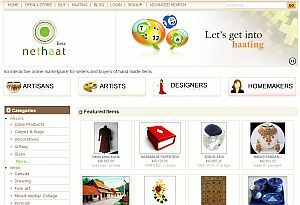 Nethaat.com has added 190 sellers so far - artisans, artists, designers and homemakers. A 110 more are in the process of setting up their stores on the website, according to the company. The company was unwilling to share the number of daily transactions or buyers saying these are very early days. Nethaat is a long term project that goes beyond just e-commerce. "We want to build a community of artists, artisans and designers and connect them directly to buyers. We want to be a landmark platform to enable them to sell online at a zero entry cost and help them with their concerns," said Sonava. The plan was cemented when a friend from Switzerland visiting India talked about wanting to purchase Indian handicrafts as a memento before leaving. What could be faster and easier than buying online? On returning from Canada, Sonava and Roshan Agarwal, an IT/IPR professional, set up an office in New Delhi and bought the website domain. 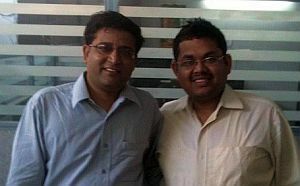 The two promoters have invested a total of Rs 9 lakhs in the company so far. The business model of the website is simple. Upon selling any product via the website, Nethaat.com receives 3.5% of the product cost. Artisans from Guwahati, Srinagar and Chennai are setting up their own sub-stores on Nethaat.com by choosing either the basic package or variants of the premium packages on offer. In the basic package, any seller can upload 25 items for free and these will be displayed for an unlimited period. For larger merchants, there is a $10 (Rs 400) per month package where he can display 100 items for sale. This package can be upgraded depending upon the number of the items he intends to sell. With the larger packages, Nethaat will offer search engine optimisation (SEO) marketing, which will help the artisans and sellers to increase their reach across the Internet. Nethaat also offers support to artisans to set up their stores on the website, handholding them through the steps, clicking photos of their work. Currently the company has representatives in Jaipur and Ahmedabad to aid artisans and plans to hire more across the country. Nethaat's locker feature is for artisans who want to protect their designs. They can upload their unique designs and generate a password which they can send to serious buyers. The password can be used only thrice, said Sonava. The locker does not fully address the problem of protecting a design. Three attempts are more than sufficient to copy a design online and there is not watermark on the designs that would prevent them from being used elsewhere. He admits that Nethaat does not yet protect artists from such occurances. Another feature unique to NetHaat.com is Haating: an online negotiation feature on Nethaat where sellers can display their excess inventory stock or any item they wish to put on sale for better turnaround. Nethaat has comprehensively looked at issues at the seller's end, but may be falling behind in addressing the buyer's concerns. For one, it does not have any quality control measures in place other than a rating feature that offer feedback from buyers to sellers. The website can take a leaf off the pages of other e-commerce websites and offer more social networking options so consumers can share a product amongst friends on Facebook or Orkut and discuss or recommend a product. A better interface offering 'hot' products or items that are similar to the one selected would also be advantageous. Nethaat.com does offer a Remind Me feature, where a customer can share important events such as birthdays and anniversaries and will be reminded to buy giftcards and other items. Various e-commerce players are attempting different methods to resolve the 'look & feel' issue when it comes to online shopping. For example, when a customer wants to buy a shoe, they might not be sure of their size since it is not standardized. What Yebhi.com, a shoe-specific online store does is to ship out two pairs of consecutive sizes so the user can select one that is a perfect fit and return the other. Refunds and replacements are also being offered on other websites but Nethaat will wait for the sellers reaction before introducing refunds. There may or may not be a price advantage a buyer gets from Nethaat.com. "It's a seller's store, they fix the price and receive the amount directly in their bank accounts. We are a platform and will not control the price," says Sonava. Online marketing of artisan work suffers because of the decentralisation in the Indian crafts industry and there are few websites directly targeting this niche. One other website is Compare Infobase Ltd's India-Crafts.com, a portal selling pottery, woodcraft, paintings and even sculptures. Compare Infobase also runs Mapsofindia.com. Another dedicated website selling hand crafted jewellery in India is Sheyna.com , a Palo Alto, California based company backed by Accel Partners, Harrison Metal Capital and Baseline Ventures, which has previously backed Twitter. Harrison Metal Capital's portfolio includes Aardvark and AdMob. Existing e-commerce websites such as eBay.in and IndiaMart.com offer hand crafted work by Indian artisans but products offered on such sites are still limited in variety. "Yes, eBay also sells handicrafts, but we wanted a dedicated website for this category as we believe it has a lot of potential, when considered stand-alone. Besides, only people who have a lot of knowledge about e-commerce such as manufacturers and exporters are on eBay, you dont see the mid-level artists selling," Sonava opined. IndiaMART is behind Village Paper Craft by Delhi based HKG Paper, a merchant now selling hand crafted paper products such as stationery items and desktop accessories online. Gurgaon-based Aimcraft.com offers unique products such as colourful umbrellas, 'organic' clothes, folk art, kaftans, crocheted mobile phone covers and jewellery. It is however targeting the non-Indian audience and its prices are in USD. The work at Nethaat.com never ends. The company has just completed a Herculean task of creating an animated video that explains its working in simple terms and in 17 national and international languages. "We had to source narrators for different languages and record the video. We hope it helps new sellers and customers understand our proposition," says Sonava. Special requests are streaming in from exporters and bulk manufacturers who want to pitch on Nethaat.com. The website may see a separate section for them. International sellers in USA, Sweden, Kenya and Canada are also interested in boarding Nethaat, the company reports. Nethaat will now tie up with artists associations and the government in the future to help the community grow and spread its rich legacy. Sonava says the government is doing its part when it comes to Indian artists by sending them abroad, helping them out in raw material and goods as well as offering them various platforms such as fairs and bazaars to sell their goods. 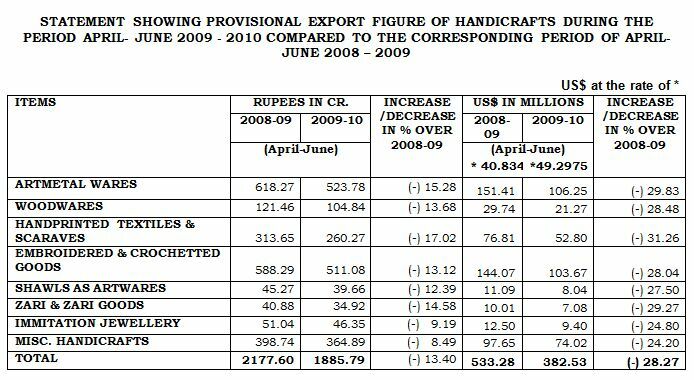 Yet as you can see from the table, exports of Indian handicrafts have fallen drastically. Nethaat will also undertake marketing exercises to help artisans reach more people with their ethnic wares and handicrafts. Online marketing with SEO and SEM will be offered and offline, the company will arrange shows in metros and cities to display the offerings and help the Indian artisan brand. Could this help revive the flailing Indian artisan industry?